An Episcopal priest, author, retreat leader, and climate activist, Margaret Bullitt-Jonas serves as Missioner for Creation Care for both the Episcopal Diocese of Western Massachusetts and Mass. Conference, United Church of Christ. She seeks to inspire and support a wave of religious activism to address the climate crisis, deepen reverence for God’s creation, and create a more just and sustainable society. (To contact Margaret, email: mbj [at] revivingcreation.org). After graduating from Stanford University (B.A. with honors in Russian literature) and Harvard University (Ph.D. in comparative literature), Margaret turned her life in a new direction: she entered seminary, earned the M.Div. from Episcopal Divinity School, and was ordained in the Episcopal Church. Her first book, the memoir Holy Hunger: A Woman’s Journey from Food Addiction to Spiritual Fulfillment (Vintage, 2000), describes how, during her years at Harvard, she overcame her food addiction and found her way to God. Margaret was ordained in June 1988, just as mainstream newspapers began to report on global warming. Shortly after the Exxon Valdez oil spill in Alaska on Good Friday, 1989, she delivered the first sermon she’d ever preached – or heard – on the urgent need for eco-conversion, calling for Christians to place care for the Earth at the center of their moral and spiritual concern. Making peace with her body led to a wider concern for the “body” of the Earth; recovery from personal addiction led to engagement in the great work of our time: transforming a society addicted to consumerism, endless growth, and fossil fuels. Margaret believes that the root of the struggle is spiritual. Margaret served as a parish priest for 16 years in the Boston area, and for 9 years at Grace Episcopal Church, in Amherst, Massachusetts. She was a Lecturer in Pastoral Theology at Episcopal Divinity School from 1992-2005, where she taught courses on prayer, spiritual formation, addiction, and environmental ministry. After completing the Spiritual Guidance program of the Shalem Institute for Spiritual Formation in 1988, she offered spiritual direction to individuals for almost two decades. 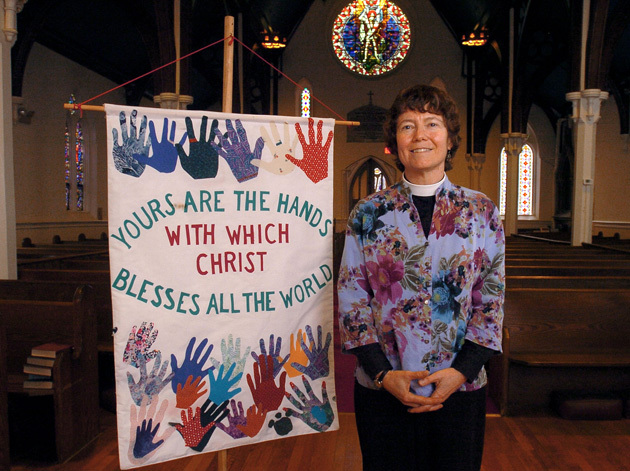 For several years she also served as Chaplain to the Episcopal Church’s House of Bishops. Margaret addresses the crowd at Step It Up Northampton, November 3, 2007. Photo ©2007 Jason Threlfall. Six months after September 11, 2001, Margaret preached on Good Friday at St. Paul’s Cathedral, Boston. Her best-selling second book, Christ’s Passion, Our Passions (Cowley, 2002), sprang from these seven sermons and explores the power of forgiveness, hope, and compassion in light of Jesus’ last words from the cross. Her third book, Joy of Heaven, to Earth Come Down (Forward Movement, 2012, 2nd ed. 2013), is a collection of daily meditations for Advent and Christmas that focus on the sacredness of the natural world. Her new book, co-edited with Leah Schade, is Rooted and Rising: Voices of Courage in a Time of Climate Crisis. Rowman and Littlefield will publish it in November, 2019, in time for the 50th anniversary of Earth Day in 2020. She is principal author of “To Serve Christ in All Creation: A Pastoral Letter from the Episcopal Bishops of New England” (2003), the Episcopal Church’s first environmental pastoral letter, and a lead author of a pastoral letter on the environment released by Episcopal Bishops in the West Coast area of the U.S. (“A Call to Action from the House of Bishops of Province VIII,” 2009). In 2013 the Anglican Review published her study of the first 25 years of the Episcopal Church’s engagement with climate change. Margaret’s work has also appeared in The Boston Globe Magazine, Comparative Literature, Comparative Literature Studies, Cowley, Episcopal Times, Fellowship in Prayer, Fellowship Magazine, Human Development, Presence, Review for Religious, Russian Review, Self Magazine, The Sign, Spirituality & Health, and Stanford Magazine, among others. Her work is included in anthologies of sermons, essays, and prayers. Margaret has spoken at climate justice rallies, conferences, and public vigils, testified at public hearings about state energy policy, fasted in front of the White House, led prayerful marches and vigils, and taken part in ecumenical and interfaith delegations to urge climate justice. One of the first to engage in civil disobedience to protest global warming, in 2001 Margaret was arrested with 21 other members of the interfaith network Religious Witness for the Earth at the U.S. Department of Energy in Washington, D.C., during a prayer vigil to urge conservation and renewable energy and to reject oil drilling in the Arctic National Wildlife Refuge. In 2009 she was a lead contributor to the Interfaith Call for 350, a global initiative by religious leaders to call for a commitment by world leaders and U.N. negotiators to stabilize global CO2 at 350 parts per million. In 2010 she led an Advent retreat on Creation care for the Episcopal bishops of New England. 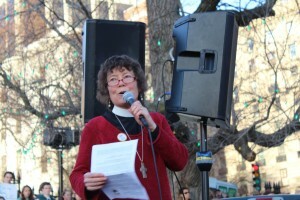 She was one of four core leaders who organized “Climate Revival: An Ecumenical Festival to Embolden the Renewal of Creation,” an historic event in 2013 that drew hundreds of clergy and Christian leaders to downtown Boston and produced a climate statement signed by the national leaders of three Churches (Episcopal Church, United Church of Christ, and American Baptist Churches). In 2013 she was a round-table speaker at a climate summit sponsored by the Episcopal Church and the Church of Sweden, “Sustaining Hope in the Face of Climate Change: Faith Communities Gather.” In 2016 she was at Standing Rock for the Interfaith Day of Prayer. In 2017, she presented to Chief Arvol Looking Horse, on behalf of National Religious Coalition on Creation Care, the 2017 Steward of God’s Creation Award to the Sioux Nation, and led a Christian ceremony of repentance for the Doctrine of Discovery (video is here). In 2016 she was arrested with 15 other religious leaders in a prayerful act of civil disobedience to stop construction of the West Roxbury Lateral Pipeline, and she again faced charges in 2017 after a peaceful sit-in at the office of Massachusetts Governor Charles Baker, urging him to stop construction of new fossil fuel projects. In 2018 she was a lead organizer of “Let My People Go! Exodus from Fossil Fuel: An Interfaith Witness to Climate Action,” held on the steps of the Massachusetts Statehouse in downtown Boston during Holy Week and on the eve of Passover (video is here). Since 1986 Margaret has led retreats and conferences around the country for dioceses, congregations, and clergy, and for parish groups, religious communities, recovering addicts, women’s groups, and young adults. Topics have ranged from clergy wellness to intimacy with God, from reconciliation to methods of prayer, but now her primary focus is on encountering God in the natural world and on cultivating wisdom, compassion, and courage in an age of climate change. As a follower of Jesus, she values the connection between contemplation and action. She treasures the power of prayer to purify and sustain our efforts to be agents of healing, hope, and justice in the world. In 2007-2009 Margaret served on the steering committee of the Genesis Covenant, an interfaith initiative by which faith groups across the country commit at a national level to cutting in half the carbon footprint of their facilities within ten years. The Episcopal Church adopted the Genesis Covenant at the 76th General Convention in July 2009. 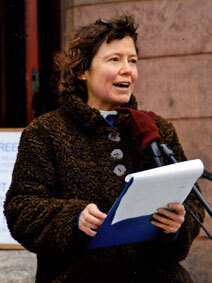 Margaret was a founding member of Massachusetts Interfaith Coalition for Climate Action (MAICCA), served on the Working Board of Better Future Project, a Massachusetts non-profit dedicated to building the grassroots climate movement, and has been a leader in New England Regional Environmental Ministries (NEREM). 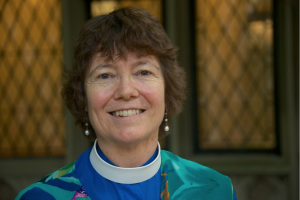 She is active in Episcopalians for Fossil Fuel Divestment and Clean Energy Reinvestment, the grassroots network that has supported the passage and implementation of divestment resolutions from Episcopal dioceses around the country. In July 2015 the 78th General Convention of the Episcopal Church voted to divest from fossil fuel holdings and to reinvest in clean energy development. She has been a trainer and served on the Advisory Board of Sojourner Truth School for Social Change Leadership since its founding in 2017. Margaret lives with her husband Robert A. Jonas (www.emptybell.org) in Northampton, Massachusetts, and is working with him to help preserve farmlands, fields, and woodlands in the Pioneer Valley. She received the 2016 Steward of God’s Creation award from National Religious Coalition on Creation Care. Margaret is available to speak, teach, and lead retreats about climate justice and Creation care. To reach her, send an email: mbj [at] revivingcreation.org. Reprinted with permission of the Daily Hampshire Gazette. All rights reserved.